It is similar to milkweed: the densely packed “silk” fibers on which the seed float away, each on its own coma. The same Latin coma has been put to use metaphorically in astronomy and botany, though of course for “hair” on vastly different scales. Those are beautiful, especially the milkweed. I remember them from back east. They were everywhere. I don’t see these in my immediate area here out west, and I wonder if it is the heavy wet clay soil in winter and drought conditions in summer that discourage them. Thanks for the links, Steve. I have bookmarked them. I am looking for more carefree, drought tolerant species of all kinds as well. Sure thing, Lavinia. I hope you find species that fit the bill. That certainly is a milkweed bug nymph, and a beautiful pod. I’m thinking it’s a species other than antelope horn, given how slender it is, but it hardly matters, given how nicely it opened for you. That little blue is scrumptious. I don’t know if I’m more fond of the color or the way it can sparkle in the sun, but I never can get enough of it. Not enough of the plant remained for me to take a stab at figuring out the species. Oh well, I’m happy to have been let off the hook, botanically speaking. 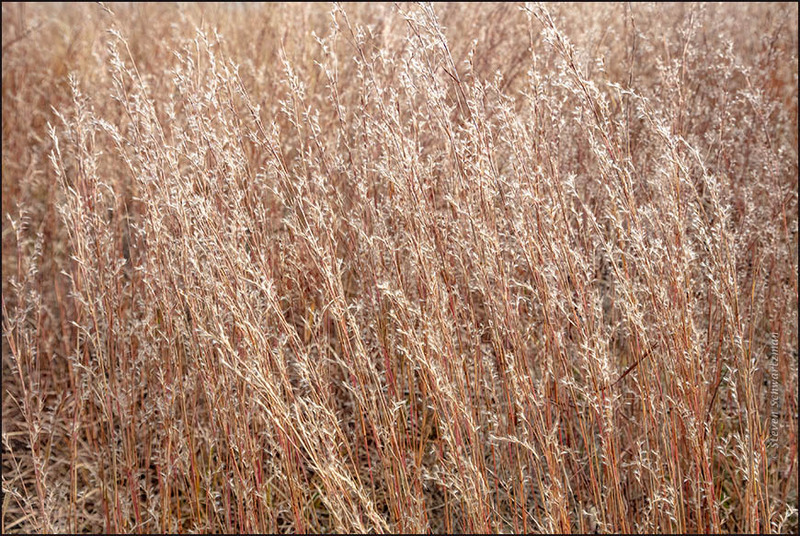 When it comes to the late stage of little bluestem, I’m with you in relishing both the color and the sparkle in the sun, and in feeling that I never get enough of this grass. It took a bit of research, but I finally found some local, native milkweed seed to try planting here. Waiting impatiently to see if they’re liking the new location. It’s been a rather dry, but warm winter here so far. Good for you for tracking down a species of milkweed native to your area. Let’s hope it thrives in your location. I’ve read that some people who want to support monarch butterflies plant tropical milkweed, Asclepias curassavica, and there’s a controversy about whether that’s beneficial or harmful. I’d be happy with the seed image even without the milkweed bug nymph. Me too. The nymph was a bonus. The milkweed pod looks awesome! 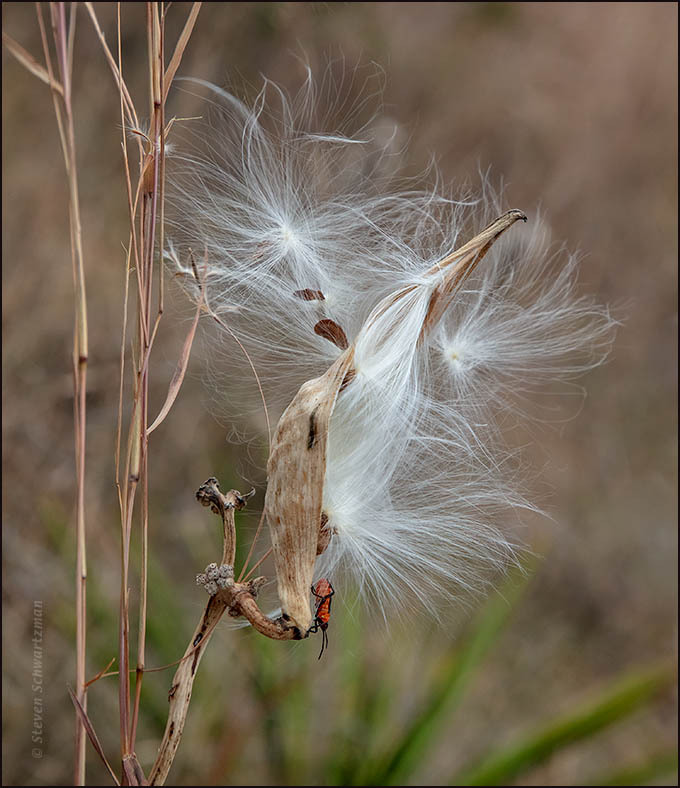 I always find milkweed pods awesome. I wish I came across them more often. As rich a color as the insect is, I guess you’d have had a hard time missing it. “Densely yummy”~I love that and you’re right, it is. I believe you’re right about the nymph. I hate them. They become quite numerous and make quite a mess of a milkweed; I’ve noticed that there is never a caterpillar on a milkweed that is infected with these beetles. I’ve known native plant people to see dense autumn grasses like this and say they seem good enough to eat. I’ve never thought about the consequences of milkweed bugs for monarch butterflies. I imagine someone must have studied that. I see that in addition to milkweed bugs there are milkweed beetles, which are also orange and black. Oh, ah. I was using the term “bugs” loosely. It is the beetles I object to. I imagine the bugs are smaller and less of an issue. I don’t know what damage the milkweed bugs might do, but I’ve been seeing them pretty often for two decades and this area still manages to produce plenty of milkweeds. This area does too. They are just a part of our wonderful web of life. I’m reading “Teaching the Trees” by Joan Maloof. All of her books are good, really. She explores all these sorts of things. I hadn’t heard of her but I see four of her books on Amazon. I’ve read two so far and enjoyed them both. I got them from the library but I did buy one. I see that the Austin Public Library has three of her books, so I may take a look. If you do I hope you enjoy them. I find her writing more readable than some nature writers. I just wrote a post on my new blog here at WP…does the link above take you to it? Maybe WordPress can tell you how to change the URL that clicking on your name sends people to. In my WP Dashboard I see icons running down the left edge. I hovered over the Users icon, the one that looks like a stylized head and shoulders, and from the choices that popped out I took Personal Settings. There in Web Address I could change the URL that a click on my name takes people to. Oh, cool. I’ll try that. By the way, from the Settings icon (which looks like two crosses or keys, one of them upside down) you can choose General to also change the time so it reflects your local time rather than Greenwich Mean Time as it currently does. I purposely leave it that way, as well as various other misdirections regarding my age and location. We wouldn’t want people to know that you’re 18 and live in Thailand. Hahaha! Nope, we sure wouldn’t. But we would like them to puzzle over the fact that at 18 you have children who are older than you. I am a woman of mystery.